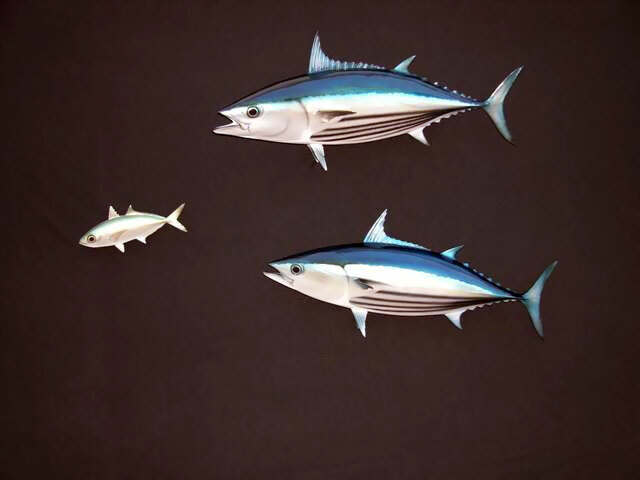 The skipjack tuna, Katsuwonus pelamis, is a medium-sized perciform fish in the tuna family, Scombridae. It is otherwise known as the aku, arctic bonito, mushmouth, oceanic bonito, striped tuna, or victor fish. It grows up to 3 ft (1 m) in length. It is a cosmopolitan pelagic fish found in tropical and warm-temperate waters. It is a very important species for fisheries.